March 14th is “Pi Day”, for reasons which should be obvious to our more mathematically inclined readers. As you are not reading this post on March 14th, that must mean we’re either fashionably late to Pi Day 2019, or exceptionally early for Pi Day 2020. But in either event, we’ve got a hack for you that celebrates the day using two things we have it on good authority most hackers overindulge in: food and needless complexity. This project comes from [Mike MacHenry], and it’s just as straightforward as it looks. Put simply, he’s using a load cell connected to the Raspberry Pi to weigh an actual pie and monitor its change over time. As the pie is consumed by hungry hackers, a pie graph (what else?) is rendered on the attached screen to show you how much of the dessert is left. One might say that this project takes a three dimensional pie and converts it to a two dimensional facsimile, but perhaps that’s over-analyzing it. In reality, it was a fun little hack [Mike] put together just because he thought it would be fun. Which is certainly enough of a motive for us. More practically though, if you’re looking for a good example for how to get a load cell talking to your non-edible Raspberry Pi, you could do worse than checking this out. We’ve also got to give [Mike] extra credit for including the recipe and procedure for actually baking the apple pie used in the project. While we’re not 100% sure the MIT license [Mike] used is actually valid for foodstuffs, but believe it or not this isn’t the first time we’ve seen Git used in the production of baked goods. Generally speaking, we don’t cover that many woodworking projects here at Hackaday. What’s the point? It’s bad enough that wood reminds us of the outside world, but it hardly ever blinks, and forget about connecting it to Wi-Fi. This doesn’t seem to bother you fine readers, so we have to assume most of you feel the same way. 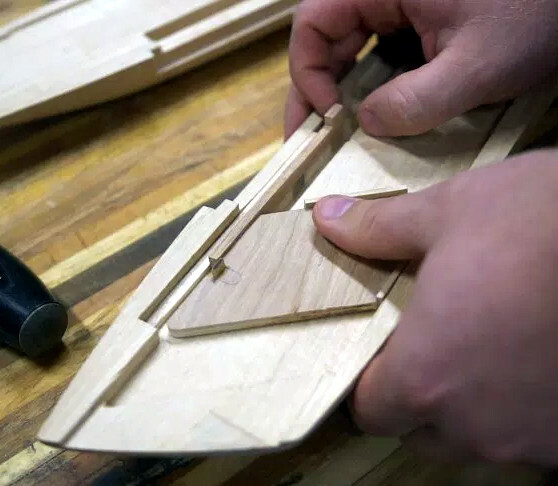 But while we might not always “get” large woodworking projects around these parts, we’re quite familiar with the obsession dedication required to work on a project for no other reason than to say you managed to pull it off. On that note, we present the latest creation of [Paul Jackman], a supersized replica of a Stanley utility knife made entirely out of wood. All wooden except for the blade anyway, which is cut from 1/8″ thick knife steel. That’s right, this gigantic utility knife is fully functional. Not that we would recommend opening too many boxes with it, as you’re likely to open up an artery if this monster slips. We can’t imagine there are going to be many others duplicating this project, but regardless [Paul] has done a phenomenal job documenting every step of the build on his site. From cutting the rough shape out on his bandsaw to doing all painstaking detail work, everything is clearly photographed and described. After the break there’s even a complete build video. The most interesting part has to be all of the little internal mechanisms, each one carefully reproduced at perfect scale from different woods depending on the requirements of the component. For example [Paul] mentions he choose white oak for the spring due to its flexibility. Even the screw to hold the knife closed was made out of a block of wood on the lathe. For whatever reason, people seem to enjoy building scaled up replicas of things. We’ve seen everything from LEGO pieces to gold bars get the jumbo treatment. We suppose it’s easier than the alternative: building very tiny versions of big things. It seems a simple enough concept: as a 3D printer consumes filament, the spool becomes lighter. If you weighed an empty spool, and subtracted that from the weight of the in-use spool, you’d know how much filament you had left. Despite being an easy way to get a “fuel gauge” on a desktop 3D printer, it isn’t something we often see on DIY machines, much less consumer hardware. But with this slick hack from [Victor Noordhoek] as inspiration, it might become a bit more common. He’s designed a simple filament holder which mounts on top of an HX711 load cell, which is in turn connected to the Raspberry Pi running OctoPrint over SPI. If you’re running OctoPrint on something like an old PC, you’ll need to use an intermediate device such as an Arduino to get it connected; though honestly you should probably just be using a Pi. On the software side, [Victor] has written an OctoPrint plugin that adds a readout of current filament weight to the main display. He’s put a fair amount of polish into the plugin, going through the effort to add in a calibration routine and a field where you can enter in the weight of your empty spool so it can be automatically deducted from the HX711’s reading. Hopefully a future version of the plugin will allow the user to enter in the density of their particular filament so it can calculate an estimate of the remaining length. The next logical step would be adding a check that will show the user a warning if they try to start a print that requires more filament than the sensor detects is currently loaded. This is yet another excellent example of the incredible flexibility and customization offered by OctoPrint. If you’re looking for more reasons to make the switch, check out our guide on using OctoPrint to create impressive time lapse videos of your prints, or how you can control the printer from your mobile device. Here’s a third model — the linear clock. [Jan Derogee] came up with it thanks to the inspiration of somewhat dubious run-ins with other kinds of clocks; we feel like this introductory video was made with tongue firmly planted in cheek. Whatever the inspiration, we find this idea clever and well executed. The running gear of the clock is just a long piece of M6 threaded rod and a stepper motor. A pointer connected to a nut rides on the rod, moving as the stepper rotates it. There are scales flanking the vertical rod, with the morning hours going up the left side and afternoon hours coming down the right. The threaded rod rotates one way for twelve hours before switching to the other direction; when the rotation changes, the pointer automatically swivels to the right scale. For alarms, [Jan] has brass rods running along each scale that make contact with the pointer; when they encounter a sliding plastic insulator to break the contact, it triggers an alarm. An ESP8266 controls everything and plays the audio files for the alarm. Unusual clocks seem to be a thing with [Jan]. His other builds include this neat phosphorescent clock and YouTube subs counter, which is sure to turn heads along with this clock. When the average person looks at a bed, they think about sleeping. Because that’s what beds are for. You cover them with soft, warm cloths and fluffy pillows and you sleep on them. [Peter] is not your average person. He’s a maker. And when he looks at a bed, he thinks about giving it the ability to track his weight. The IKEA bed has four Chinese-made TS-606 load cells under each foot with custom aluminum enclosures. Each one goes to an HX711 analog-to-digital converter, which offers a 24 bit resolution. These feed an Arduino Nano which in turns connects to a Raspberry Pi via USB to UART bridge. Connecting to the Pi allows [Peter] to get the data onto his home network, where he plots the data to gnuplot. This smart bed doesn’t just track [Peter’s] weight. It can also track the weight of other people in the house, including his pets. Be sure to check his GitHub for full source code.